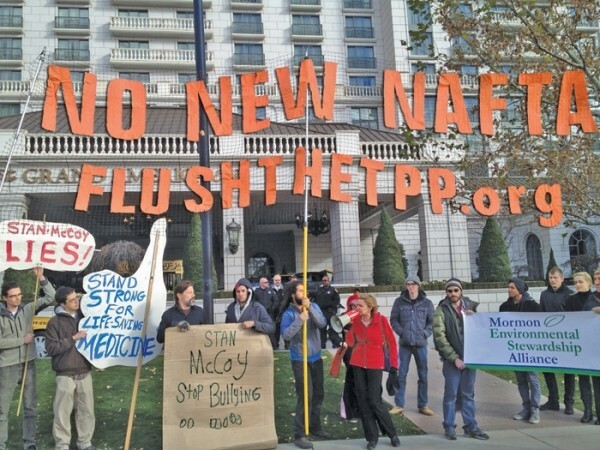 To pedestrians passing by the Grand America Hotel on Nov. 23, the letters TPP didn’t mean much. But for the few dozen hardy activists warming themselves over a fire barrel and chanting themselves hoarse outside the secretive Trans-Pacific Partnership discussions, the TPP holds much to fear. The TPP is an ambitious trade agreement between a dozen member nations, affecting two-fifths of the world’s economy and one-third of all trade. Activists say the agreement could diminish U.S. environmental and labor standards and could even allow foreign countries to sue the United States in an international tribunal if they feel American laws might hurt anticipated “future profits” of multinational corporations. “Regular people like us just feel like dogshit,” says activist Kim Kasey in regard to the meeting’s super-secret negotiations. Supporters of the talks, however, include Utah’s Republican Sen. Orrin Hatch, who, according to a report by KUER 90.1, said at a press conference that the TPP would increase global competitiveness, beneficial to the country and the state, and said international trade is essential to hundreds of thousands of Utah jobs. TPP is a high-stakes agreement between Pacific Rim countries: the United States, Canada, Mexico, Japan, Peru, Chile, Vietnam, Malaysia, Singapore, Brunei Darussalam, Australia and New Zealand. The TPP is open to new member nations in the future, but as the conservative magazine Economist notes, the group so far seems to have purposefully excluded China, perhaps as a means of giving the United States the upper hand in a trade coalition that could compete against the rival Regional Comprehensive Economic Partnership, of which China is a prominent member. All the high stakes apparently have also meant high secrecy. The location of the TPP meetings wasn’t revealed until two weeks before they occurred. Even with that relatively short notice, Peter Litster, an organizer with BackBone (BackBoneCampaign.org), a TPP watchdog group, drove from Washington State to Utah to help mobilize protest actions. “In 1999, the World Trade Organization met in Seattle,” Litster told the crowd Saturday. “When that meeting was coming down, people had nine months’ advance notice to prepare, and there were over 80,000 people who showed up in the city of Seattle.” The tumult of protesters outside the WTO meeting, Litster went on to say, helped “shut down” the 1999 trade talks. Litster says he was proud of how local activists were able to mobilize protests for every day of the Salt Lake City meetings, but said that they had little notice to truly prepare. And the text of the trade agreement has not been released to the public, which is something even the Bush administration agreed to in 2001 when it held similar regional trade talks. Kasey, who is also an organizer of March Against Monsanto, has concerns about standards of food imported into the country from TPP member nations. For example, she says, one TPP provision suggests that the United States would not be able to ban meat imports from member nations who claim to have an “equivalent” inspection standard to ours. “These countries can go ahead and say we have equivalent standards, but that’s no guarantee,” Kasey says. A nation potentially claiming to have developed inspection processes and regulations as strict as the United States’ as a way to duck standards worries Kasey. She sees it as an attack on consumers for the sake of lowering trade barriers. “The [standards] we have in place will be usurped by this treaty,” Kasey says. Fighting Pre-Crime Against Future Profits? Another controversial aspect of the TPP is a proposal that would give multinational corporations the ability to sue member nations when they establish laws or regulations that would be a trade barrier, perhaps through increased labor or environmental standards. Bart Tippetts, an organizer with the Mormon Environmental Stewardship Alliance, worries about what impact this may have in Utah, where a Canadian company is currently seeking to develop and refine oil shale. “If we want to put limits on that extraction and refining, [the company] can put monetary damages on that and sue,” Tippetts says. It’s an end-run to local sovereignty, he says, and it’s exactly why it’s not just Progressives but also Conservatives and Libertarians who are worried about the TPP. “It’s big government in cahoots with world government in order to infringe upon individual sovereignty,” he says.